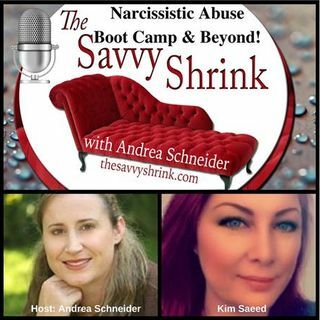 003: Kim Saeed: Narcissistic Abuse - Boot Camp & Beyond! Join your host Andrea Schneider and lifecoach, author, and healer Kim Saeed for a discussion about Kim's work helping victims of narcissistic abuse. Kim has a methodology around healing that stands apart from the crowd. The focus is on no contact and self-love. There is a reason she has millions of followers of her work. Kim's organization, Let Me Reach, was created to spread awareness of narcissistic, sociopathic, and emotional abuse, as well as the dynamics of toxic relationships. ... See More Here you will find inspiration, motivational quotes, as well as healing resources that will help you overcome the symptoms of PTSD, C-PTSD, abandonment grief, and emotional trauma. Topics that are covered on Let Me Reach include: surviving narcissistic abuse, No Contact, cognitive dissonance, detaching from toxic relationships, the power of self-love, and much more. Reach for your higher self! Life begins after No Contact!